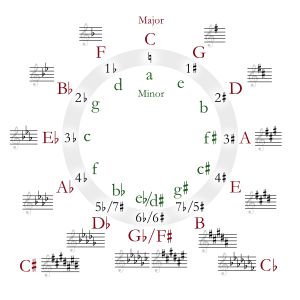 In music theory, B-flat major is a major scale based on B♭, with pitches B♭, C, D, E♭, F, G, and A. Its key signature has two flats. Its relative minor is G minor and its parallel minor is B-flat minor. Many transposing instruments are pitched in B-flat major, including the clarinet, trumpet, tenor saxophone, and soprano saxophone. As a result, B-flat major is a popular key for concert band compositions. In most Central and Northern European languages (German, Hungarian, Nordic, Baltic, Western and Southern Slavic languages, except Bulgarian), the pitch B is usually called "H" while B♭ is called "B". Joseph Haydn's Symphony No. 98 is credited as the first symphony he (or anyone else) wrote in that key in which he included trumpet and timpani parts. Actually, his brother Michael Haydn had written one such symphony earlier, No. 36, though Joseph Haydn still gets credit for writing the timpani part at actual pitch with an F major key signature (instead of transposing with a C major key signature), a procedure that made sense since he limited that instrument to the tonic and dominant pitches. Many editions of the work, however, use no key signature and specify the instrument as "Timpani in B♭–F". Five of Mozart's piano concertos are in B-flat major. Prelude Op. 28, No. 21 "Sunday"
This page was last edited on 24 March 2019, at 04:07 (UTC).